You’ve heard by now that the Australian men’s Test cricket team were caught ball-tampering in a match against South Africa. Cameron Bancroft was caught on camera scuffing the surface of the match ball with a piece of sandpaper, and tried to hide the evidence when informed that he’d been filmed in the act. Australia Captain Steve Smith admitted at a press conference to knowing of the ball-tampering plan. It transpired that vice-captain Dave Warner hatched the plot and deputized Bancroft to do the dirty work. So, what exactly were they trying to do? And what happens now? Broadly speaking, there are two components to a cricket ball. The core is made of a ball of granulated cork wound in five layers of yarn. The leather exterior consists of two hemispheres (which are in turn made of two quarter-pieces each) stitched together with linen thread. This seam that joins the two halves of the ball rises a few millimeters above the surface of the ball all the way around. The red balls used in Test cricket are identical to the white balls used in One-Day and Twenty20 cricket (and to the pink balls now used in day-night Tests), save for the color of the dye applied to the steerhide leather. The condition of a cricket ball hugely affects how it travels through the air as it is bowled to a batsman, and that condition changes dramatically over the course of a game. Unlike in baseball, the same ball is used for a large portion of a cricket team’s innings—the ball is replaced after 80 overs, or 480 deliveries. (That’s why a lucky fan catching a ball in the crowd will always throw it back onto the field.) The ball takes a battering over that time, being smacked with the batsmen’s wooden bats, being slammed into the rock-hard pitch with each delivery, and thudding into the wicket-keeper’s leather gloves. This wear and tear quickly renders an old ball unrecognizable from a new one. The condition of the ball translates into action in a few practical ways. When the ball is new, a delivery that hits the pitch with the seam upright (pointing directly from bowler to batsman) will gain significant extra bounce, much to the bowler’s advantage. As the ball ages, the seam gets worn down and this benefit is lost. And, most relevantly for us, the comparison of the roughness of the three components of the ball’s surface—the two hemispheres and the seam—can cause the ball to arc sideways through the air, a movement known as swing. A cricket ball travelling at 140 km/h will take approximately 0.45 seconds to arrive at a batsman from the bowler’s hand. If the bowler can make the ball swing—adding another element that the batsman has to calculate in addition to the delivery’s speed, line, length, and bounce—that’s good. A new ball will generate swing because of the difference in roughness between the polished surface of the ball and the raised seam. If the ball is delivered with the seam angled slightly across the batsman, the ball should swing across the batsman in that same direction. This conventional swing will usually last for a while at the start of an innings before the seam starts to wear down. Far more elusive is reverse swing, which can be generated when the ball is older, because of the difference in roughness between the two hemispheres of the ball. As the name suggests, reverse swing sends the ball the opposite way to conventional swing. While a new ball will almost always generate significant swing at the start of an innings, reverse swing is difficult to dependably produce, in part because both halves of the ball can be expected to get knocked about at the same rate, and so achieving a large enough difference in roughness of the sides is challenging. Cricketers have been trying to master the art of reverse swing bowling since the invention of the sport. There’s no sure-fire delivery technique that can reliably produce it—it is largely a scientific sensation dependent on the condition of the ball and the whims of the cricket gods. This makes it all the more dangerous, as batsmen are not able to accurately predict when the ball will start to suddenly move sideways. Reverse swing is a phenomenon for which there is no obvious analogue in any other sport—a fielding team might toil for hours upon hours with a lifeless ball that has long since lost its zeal, when suddenly this quirk of quantum physics deems that the exact corporeal makeup of a sphere of leather fits the exact physical formula to unlock cricket’s inbuilt cheat code. An enlightened understanding of swing bowling is cricket’s holy grail. The fielding team in a cricket match therefore seek to do everything they can in order to help create a difference in roughness between the two halves of the ball. As the first few overs of an innings progresses and the ball is knocked around a few times, the team will identify one side of the ball to be preserved in good condition as the shiny side, and one side to be left to deteriorate as the rough side. Players are allowed to polish the ball on their clothing in order to keep the shiny side shiny. This is done by oiling the shiny side with some saliva or sweat, and rubbing it furiously on one trouser leg, causing the quintessential red stain down the white cricket pants. Undoubtedly one of the best aspects of junior cricket was emulating your heroes by making an unnecessarily large red track down one leg in order to show how hard you’d been working on the ball. The laws of cricket permit polishing the ball in order to preserve the shiny side, but prohibit the use of artificial substances to do so. Accelerating the deterioration of the rough side is not allowed. That’s the rule that Bancroft violated—it was an open and shut case based on video evidence even prior to his and Smith’s admission. Ball tampering is considered to be an especially ugly cricketing crime. I suspect it’s partly because it feels like a breach of trust—you’re allowed to perform this completely legal action of shining the ball hundreds of times per game, right in front of us in broad daylight, and all that we ask is that you don’t make us look stupid by cheating right under our noses. The use of a nefarious foreign object to corrode the ball feels exploitative. The frankness of Steve Smith’s admission was jarring. We deliberately tampered with the ball to try to gain an advantage. The players—plural—in the leadership group discussed it beforehand and thought it was a terrific idea. He insisted that this was the first and only time that it had happened, an implausible claim that finds support only in the Mr. Bean-level of competence in the way the operation was conducted. The South African batsmen had complained to the umpires during the previous Test that they suspected Warner was using tape on his hand to roughen the ball. Indeed, the Australians had been generating reverse swing suspiciously early in each innings. That led commentator Fanie de Villiers, an ex-Protea great, to instruct his station’s cameramen to track the ball during the Test. At the now-infamous press conference, Bancroft said that he used tape covered in coarse dirt to scuff up the ball. That was a lie; the Cricket Australia investigation found that he used sandpaper. In the dressing room, Warner had demonstrated how the deed should be done. The fear is that this has been happening under our noses forever, not just by a few bad apples but by just about everyone—cricket’s version of baseball’s steroids saga. The list of known ball-tampering episodes in cricket is already quite long and features many of cricket’s greatest names. The list of episodes we don’t know about is obviously much longer. It seems to be an issue impossible to comprehensively police, as the potential for innovative new methods of ball-tampering is unquantifiable, and TV cameras won’t catch everything (especially at lower-level cricket). Nor is there an immediately obvious amendment to the rule which would produce a common-sense middle ground—the current rule seems to occupy that middle ground by allowing some work on the ball but only using “natural” methods, while allowing the use of foreign objects in manipulating the ball surely just leads to players conducting medical experiments on the ball, giving us a totally different sport to what we have now. Perhaps the biggest factor driving the reaction inside and outside of Australia is the fact that Test cricket is a clash of nations, and cricket is Australia’s national sport which carries a rich and proud history. Everybody wants to be represented in the sporting arena by GOATs like Don Bradman, Shane Warne, and Adam Gilchrist, by badasses like Steve Waugh, and by oddball excitement machines like Glenn Maxwell and James Faulkner. Nobody wants to be represented by Dennis Denuto’s shady nephew. It wasn’t the players that cheated; it was Australia that cheated. The captaincy of the Australian men’s Test cricket team is facetiously referred to as the second-highest office in the land. Well, the man occupying the highest office in the land chimed in on the saga, as did every single person in the cricketing world and many from outside it. 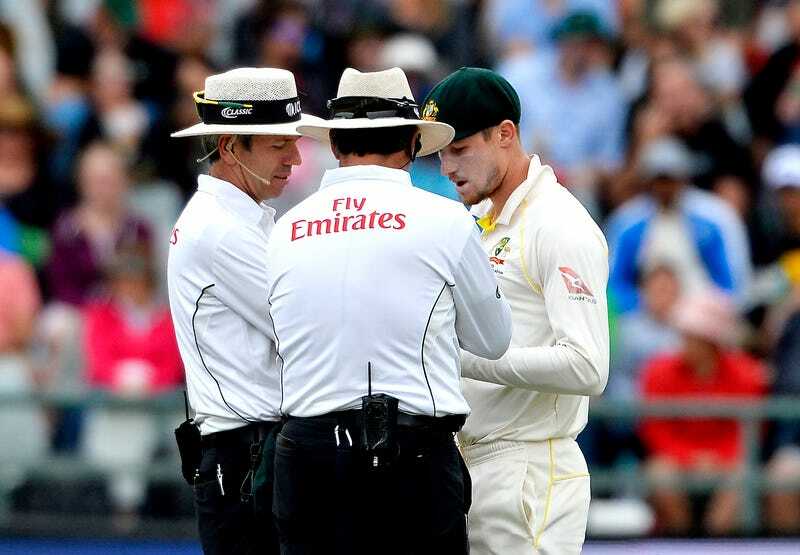 Smith was suspended for one Test match by the International Cricket Council, with Bancroft receiving a fine. Cricket Australia announced today that Smith and Warner are suspended from international and domestic cricket for 12 months, while Bancroft received nine months. Smith and Bancroft are not eligible for leadership positions for 12 months after their bans end; Warner will never again be eligible. Smith and Warner have been dropped from their Indian Premier League contracts, worth $AUD2.4 million each (for seven weeks’ work! ), and banned from that competition for this season. Smith earned about $AUD2 million in annual base salary plus match fees and endorsements—one of which he’s already lost—while Warner raked in about $AUD800,000 base salary plus match fees and the uncontracted Bancroft only received match fees. Everyone will have a different opinion as to what the correct sanction for each player should have been. The difference between the ICC sanction for breaking the rules and the Cricket Australia sanction for misconduct is certainly jarring. The next player that gets caught certainly can’t say they didn’t know what they were getting into. Ben is a Deadspin reader who likes cricket.